This is probably the easiest recipe I'll ever share with you, and also one of the most delicious and rewarding! Quantities are not exact and don't matter anyway. 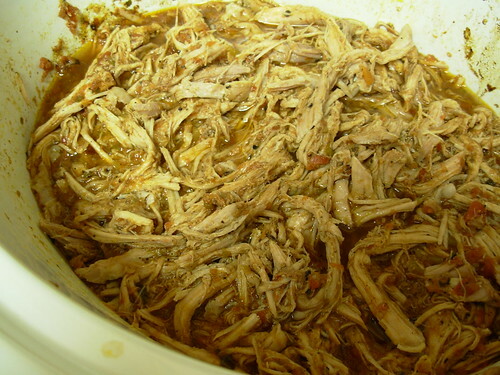 Put the pork into a crockpot, dump the salsa on top, and cook it on LOW for 6-8 hours. When you're ready to eat, just shred the meat with two forks. The meat is tender and delicious and people will think you put some serious effort into cooking, but it just couldn't be any easier. I really gotta get a crock pot. I foolishly gave mine away before ever using it. Stupid!! Looks great and easy. Love it! Would this work well with beef? I don't see why it shouldn't work with beef. Get a nice fatty cut that will melt in the slow cooker though, like a chuck roast. I make this with beef and we love it. I like to serve it over spinach for a nice mexican-food type salad. Additionally, it’s going to save all of Cheap SWTOR Credits.All of us run into virtual goods becoming sold for many Sell WOW Gold of dollars in the Globe associated with Globe of warcraft game. Whenever you obtain RS Gold remarkable it will assist get a occupations to some higher level.